I am excited to share our member spotlight of the Institute for Child Development with you. The Institute for Child Development has been an integral part of CASP’s development as an organization and their Executive Director, Dr. Ray Romanczyk, was one of CASP’s founders. I’d like to thank Associate Director, Dr. Jennifer Gillis for her thoughtful answers. Read below to find out more about their programs and the unique legislation that was passed to enable them to operate on the campus of Binghamton University. Over the next few weeks I’ll also be sending out exciting information about CASP Conference speakers and activities. Keep an eye out! We are celebrating 7 years of our summer SLC series! 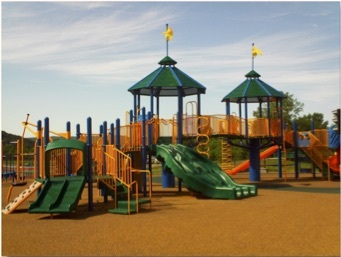 Families of children with ASD can sometimes struggle to find playgrounds where they do not need to worry about elopement, precarious equipment, and even the stigma sometimes felt as a parent of a child with ASD. During the warmer weather months, we open our playground to the community – for families with and without children with ASD. Word among children and families in the community is that we have the “best playground ever.” Our staff volunteer their time on Saturdays to help everyone enjoy a fun and safe time. And, we always have cold water and summer treats for everyone to enjoy…after all, it is summer! By way of an act of the NYS legislature in 1974, our school (a non-public special education school) is able to be located on state property (Binghamton University). We believe that we are the only private special education schools like this in NY. In addition to our school, we have a very active diagnostic clinic focusing on very young children, conduct periodic free screening clinics, and provide academic training for undergraduate, graduate and medical students.